Can the Rally Keep Running? Small-caps came roaring back in 1Q19 (along with the rest of the U.S. stock market), as the Russell 2000 Index gained 14.6% for the quarter. The upswing followed on the heels of a dismal 4Q18, when small-caps fell 20.2% (and were down 11.9% in December alone). In the midst of December’s steep downdraft, it looked to us as if the market was experiencing something like a manic episode. 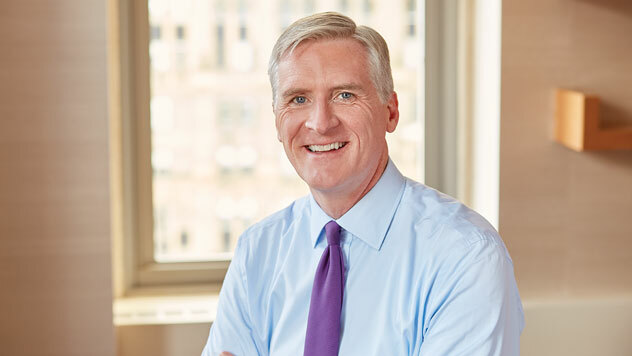 As we observed at the time, it appeared that market sentiment had become detached from company fundamentals, creating an opportunity for selective patient investors. The rally that kicked off 2019 was the reversal of this dynamic. While the rebound itself was unsurprising, though no less welcome, its combined strength and speed were more of a surprise. 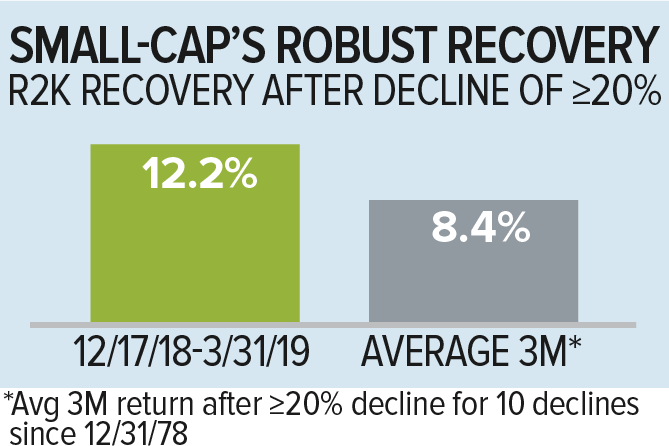 Following the first day of a decline of at least 20%, the average three-month recovery for the Russell 2000 has been a gain of 8.4%, and the small-cap index gained 12.2% from 12/17/18, the first day following its 20% decline, through the end of March. Although the Russell 2000 also made up more than half of the ground it lost from its most recent (and all-time) high on 8/31/18 through 12/24/18, the index still finished 1Q19 10.8% shy of that peak. With China flirting with recession, Europe weak, and the U.S. economy slowing, it made sense that small-cap market leadership came mostly from high growth stocks in 2019’s opening quarter rather than economically sensitive value stocks. In fact, the performance pattern of 1Q19 basically flipped the script from 4Q18: growth beat value, non-dividend payers outpaced dividend payers, and non-earners (companies with negative operating income) gained more than earners. 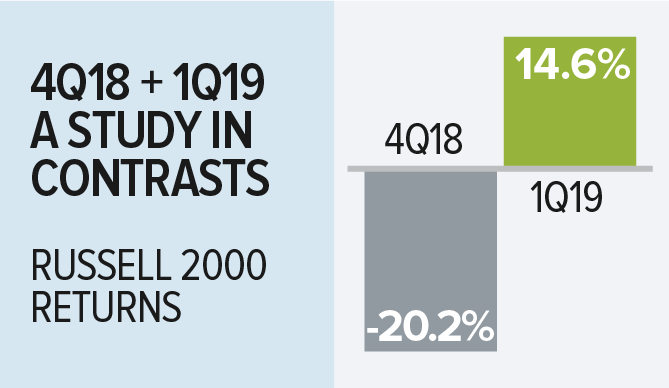 The exception in 1Q19 was that defensives slightly outpaced cyclicals, driven by strong performances from high-growth areas like software and the bio-pharma complex. There was an interesting mix of results at the sector level. Information Technology and Energy led while Consumer Staples and Financials were the biggest laggards, though each had a positive return. 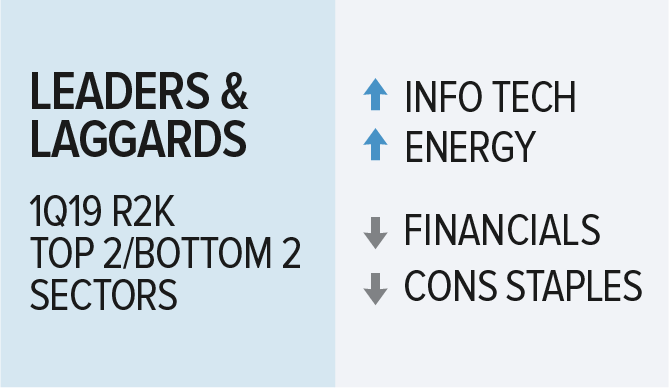 Energy recovered from a highly forgettable 2018, when it was the worst-performing sector in the small-cap index, while Information Technology saw broad-based strength from the high-growth software group while also getting benchmark-beating performance from cyclical areas that that we like, such as electronic equipment, instruments & components and semiconductors & semiconductor equipment. The lag for Financials came from its two largest industries—banks and insurance, both of which were negatively affected by the Fed pivot to holding the line on further interest rate hikes. There were also a couple of counterintuitive developments in 1Q19. In a broad rally that saw all 11 Russell 2000 sectors finish March in the black and cap-weighted and equal-weighted small-cap returns very close—the equal-weighted return for the quarter came in at 13.7%—only 77% of the companies in the index had positive returns. This percentage looks low to us in light of the fact that 89% of the index’s companies had a negative return in 4Q18. Of course, this also suggests that attractive opportunities may be found within that 23% of stocks, where recent negative returns have created low expectations. What’s Next for Small-Cap Returns? In this context, the obvious query is, “What’s next?” The question becomes even more interesting in the context of small-cap history. The Russell 2000 has had 10 declines of 20% or greater in its more-than-40 year history. Small-caps enjoyed positive 12-month returns in nine of the subsequent 10 periods following the first day of the 20% decline (the exception was the period following the Financial Crisis); eight had returns in excess of 10%, and five of those had 12-month results of more than 20%. Cumulative 24-month returns following these 10 declines were also encouraging. Nine periods had positive performance (the exception again being the period following the Financial Crisis), with eight of the nine spans having a two-year cumulative return of at least 30%. 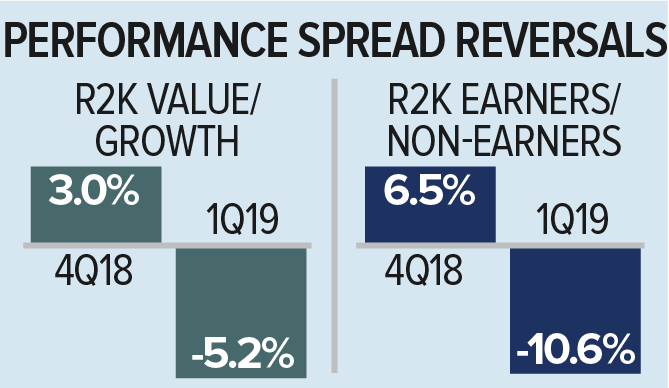 All of this suggests that the rally has room to run even with the possibility that gains could be consolidated over the next several months given the strength of 1Q19’s performance. As we look forward, then, some matters appear clearer to us than others. History certainly suggests that stocks have more running room in their recovery from 2018’s second-half decline, though it’s less clear to us where small-cap leadership will come from in this next phase. One can certainly make the argument that environments with slow economic growth and low interest rates are usually favorable for growth stocks. However, the expectations for these stocks also look unsustainably high to us, especially with the possibility of increased global regulation for technology behemoths and potential price controls of pharmaceuticals. Many small-cap cyclical businesses, on the other hand, look more reasonably priced to us than their high-growth counterparts as measured by EV/EBIT (Enterprise Value/Earnings Before Interest and Taxes). 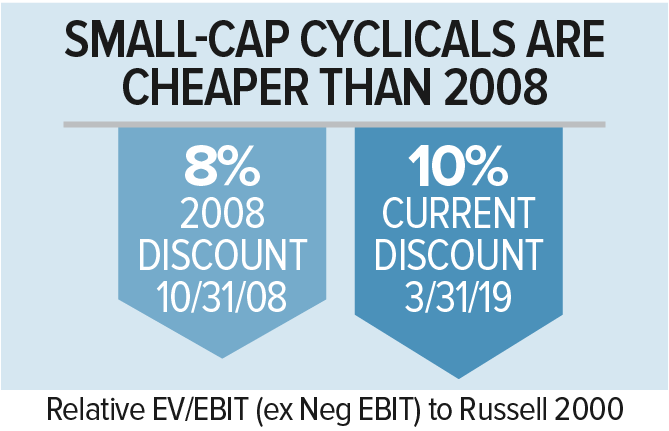 Equally if not more important, cyclicals are also trading at a 10% discount to the overall Russell 2000 (again as measured by EV/EBIT)—which is their deepest discount in 20 years. And some of these same companies offer what we see as a winning combination of high ROIC, attractive cash flow characteristics, low expectations, and/or the potential for earnings growth. In our own investments, we are working to take advantage of a market that seems unconvinced about the possibility of economic reacceleration, even as the developed world’s central banks seem prepared to use all of the monetary tools at their disposal to sustain or reignite growth. This leaves us in the position of liking many of the valuations that we’re seeing, where our selective optimism contrasts with what we view as excessive pessimism from other investors. The thoughts concerning recent market movements and future prospects for small-company stocks are solely those of Royce & Associates, LP, and, of course, there can be no assurances with respect to future small-cap market performance. Cyclical and Defensive are defined as follows: Cyclical: Consumer Discretionary, Energy, Financials, Industrials, Information Technology, Materials. Defensive: Consumer Staples, Health Care, Real Estate, Telecommunication Services, Utilities. Frank Russell Company (“Russell”) is the source and owner of the trademarks, service marks and copyrights related to the Russell Indexes. Russell® is a trademark of Frank Russell Company. Neither Russell nor its licensors accept any liability for any errors or omissions in the Russell Indexes and / or Russell ratings or underlying data and no party may rely on any Russell Indexes and / or Russell ratings and / or underlying data contained in this communication. No further distribution of Russell Data is permitted without Russell’s express written consent. Russell does not promote, sponsor or endorse the content of this communication. All indexes referenced are unmanaged and capitalization-weighted. The Russell 2000 Index is an index of domestic small-cap stocks that measures the performance of the 2,000 smallest publicly traded U.S. companies in the Russell 3000 Index. The Russell 2000 Value and Growth indexes consist of the respective value and growth stocks within the Russell 2000 as determined by Russell Investments. The performance of an index does not represent exactly any particular investment, as you cannot invest directly in an index. Past performance is no guaretnee of future results.